In the specific field of spatial radiations and shielding analysis, reference modeling tools like GEANT-4, ESA/GRAS or SPIS require as an input the geometrical description of modeled spacecrafts in the Geometry Description Markup Language (GDML) format. GDML is based on a rich CSG approach and can be used to create complex and realistic geometrical systems to be used for various purposes. As an XML-based language, GDML can be fairly well read by humans and it is quite simple to parse it. However, one of its limits is that it is difficult to visualize what a GDML file is going to produce just by looking at it in a tailored sense, i.e. 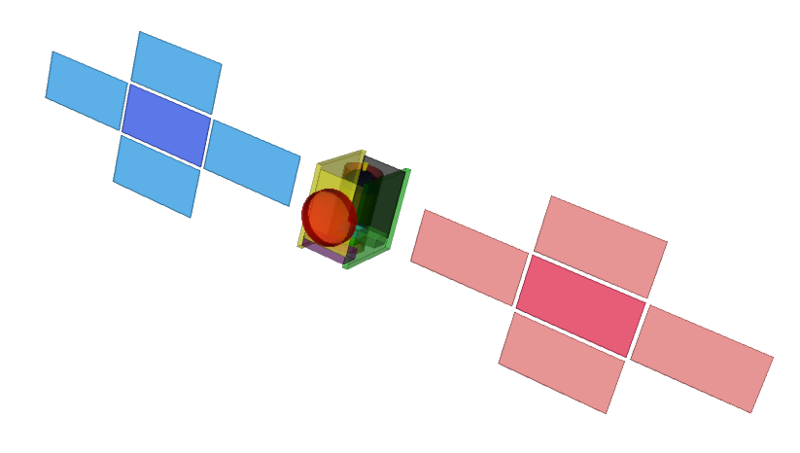 as a 3D geometrical system. Although some viewers or editors exist, only some of them are publicly available, and they are not user-friendly or incomplete. >> Link to the community of EDGE users. The ExtendeD Gdml Editor EDGE is a GDML editor developed by Artenum and based on the IME Keridwen. The purpose is to propose a simple-to-use, cross-platform editor with good capacities of visualization, and able to handle a complex hierarchy, as well as geometrical and material properties. Based on the VTK library and written in Java, EDGE is available as a fully compliant OSGi application, integrated in the Spacecraft Plasma Interaction System SPIS. EDGE is currently available only within the SPIS-Services packages. For other usage, please contact us..